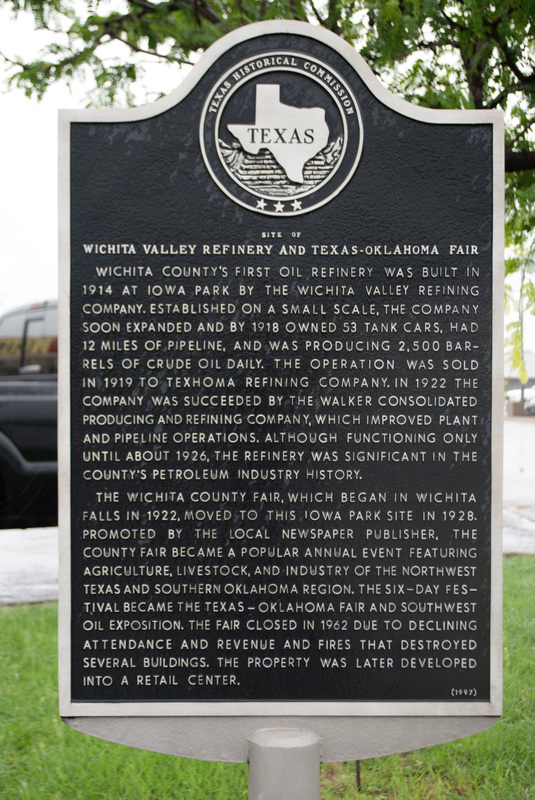 Wichita County's first oil refinery was built in 1914 at Iowa Park by the Wichita Valley Refining Company. Established on a small scale, the company soon expanded and by 1918 owned 53 tank cars, had 12 miles of pipeline, and was producing 2, 500 barrels of crude oil daily. The operation was sold in 1919 to Texhoma Refining Company. In 1922 the company was succeeded by the Walker Consolidated Producing and Refining Company, which improved plant and pipeline operations. Although functioning only until about 1926, the refinery was significant in the county's petroleum industry history. Located on the median of the boulevard on West Park and Colorado Street. GPS coordinates: 33-degrees 57' 8.7" -98-degrees 40' 18.8".